Prayerful protest: Hundreds of Brisbane pro-life supporters joined the first silent demonstration against legalising abortion in Queensland. HUNDREDS prayed the Queensland Government would continue to uphold a child’s right to live during the first pro-life march through Brisbane last week. More than 400 people, including Catholic supporters, converged for the first March for Life through Brisbane city in a silent protest against abortion. The march took the pro-life message from Queens Park to Parliament House in an effort to voice opposition to legalising abortion, which is still a crime in Queensland. Catholic pro-life woman Anne-Marie McClarty was among the hundreds praying for thousands of women who might walk through an abortion clinic this year. “I think it was a prayerful presence,” she said. “Somehow people’s hearts were being touched. “I did see a pregnant woman, she was outside, and she was obviously working because she was in a uniform. Ms McClarty said the march gave a “visual presence” to a group who believed abortions should not be allowed because “life is sacred”. “Firstly (abortion) hurts babies and it hurts women,” she said. “We’re not giving people the choice of their life. The march ended with brief keynotes addresses from Brisbane father and businessman Daniel Edmonds, prominent pro-life supporter Graham Preston and Australian Christian Lobby’s Wendy Francis. Mr Edmonds (pictured above) called abortion “the greatest human rights abuse in our time”. “That abuse is saying that killing is the solution to social problems,” he said. Mr Edmonds said members of the pro-life movement needed to make abortion the primary voting issue for local, state and federal elections. “Once you’ve voted on this issue, you must, must, must talk to every elective representative in every body, anyone that represents you in any parliament, that this is why you either are voting for them or against them,” he said. Mr Preston said abortion was a “deliberate and open destruction of young human lives” advocated in Australia for decades. “Perhaps two to three million young lives have been taken in the last 40 years in Australia, two to three million lives in this country,” he said. The Brisbane-based father is facing either a $10,000 fine or a one-year jail sentence for standing outside an abortion clinic holding signs of two United Nations documents signed by Australia stating every human’s right to life. He and two other pro-life supporters were arrested for engaging in a prohibited act within 150m of an abortion clinic. Protests within 150m of any Tasmanian abortion clinic are illegal. Mr Preston said the court’s decision on the case was due on May 11, but expected it may end up in the High Court if an appeal was made. “Even though Australia is a signatory to both of those documents, apparently it’s not legal to display them in public in places in Tasmania,” he said. Australian Christian Lobby Queensland director Ms Francis said no human law should legitimise abortion. “Our country is suffering from a deep moral confusion and we each have a choice to make,” she said. There was no organised pro-choice protest at this year’s campaign. Cherish Life Queensland state president Teresa Martin said the pro-life march had a “spiritual calm”. “You did feel God’s grace as you were walking, and it was not of this earth but it was a real spiritual calm,” she said. 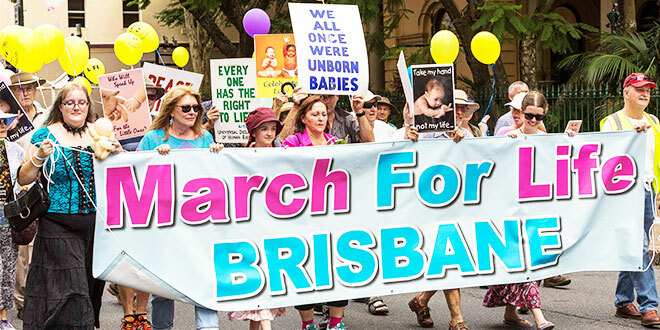 March for Life Brisbane will be an annual event held in March.